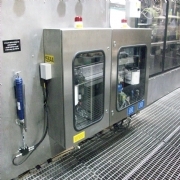 Interlube systems have installed new lubrication systems to two Can fillers in the UK. The systems were desined to alarm if the lubrication system was not operating correctly and if the system fault was not rectified after 1/2 hour the filler was programmed to shut down. There were two Interlube HDI pumps installed inside a stainless steel enclosure (complete with window and external fault beacon). One pump was to deliver the grease to the bearings on the machine and one of the pumps was to spay grase onto the gears as the filler was operating. The grease application to the bearings and the gear was fully adjustable. 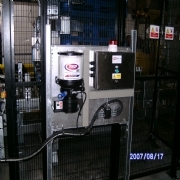 The lubrication system enclosure was mounted outside the machines guards giving easy access to the pumps, comtrollers and enabled the filling of the grease reservoirs to be done whilst the machine is in operation. Please send me more information on Can Filler lubrication System Automatic Lubrication System.